Last Bus Out tells how Courtney Miles charged past a police roadblock and argued with a National Guardsman who threatened to lock him in the makeshift jail at the Greyhound Bus Station. Sick with worry about his missing grandmother, he drove his passengers to safety, then went back into the city at midnight to help others. His adventure would ultimately lead to starting his life over on the opposite end of the country, far away from the three women he loves – the mother who abused him, the grandmother who taught him how to survive, and the girlfriend who would betray him. Last Bus Out chronicles Courtney’s life alone while his mother was repeatedly jailed for selling drugs. At seven he woke up with a gun in his face on Christmas Eve. At thirteen he witnessed the murder of a man three feet away from him. As a high school junior he lived alone in an empty house without electricity or water. Courted by gangs who knew he was hungry, “Streets,” as he was nicknamed for his solitary life on the streets, lived apart and kept his record clean – until the day he risked his freedom to save his neighbors. Courtney’s passengers describe hacking their way through attics, fighting rats and snakes for dry roof space, wading past bloated bodies in toxic waters, and searching for missing family members while grieving for loved ones lost. I remember hearing about Hurricane Katrina and its aftermath on our local news 6 years ago. My heart went out to all the people of New Orleans and surrounding area. I remember being shocked at just how bad it really was. When I got the offer to review Beck McDowell’s book, Last Bus Out, I knew I just had to read this book. 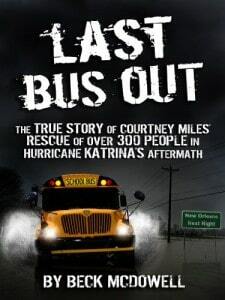 Courtney Mile’s story about how he endured Hurricane Katrina and helped hundreds of people was one that piqued my interest and I wanted to experience what he went through first hand. Beck McDowell draws the reader in from the very first page and we learn what kind of person, Courtney Miles is. He is not your typical teenager and has already overcome huge hurdles in his life with his mother being in jail, absent father and not having enough money for food or shelter. I was amazed right from the start just how strong this boy really was. Courtney had a good head on his shoulders even though he lived in a rough neighbourhood and was surrounded by violence and illegal activities every single day. I liked him right from the start. I was captivated reading Courtney’s description of experiencing the actual hurricane as he lay huddled inside his girlfriends apartment with her family. It sounded absolutely terrifying. When Courtney left the next day to go back home, he was overwhelmed with all the destruction Hurricane Katrina left in her path. It was like a war zone. For days, the people in his town waited and waited for help to come because there was no electricity, no food or clean water and they were feeling hopeless. It was terrible actually and I couldn’t even imagine just how awful it must have been to wait for help that never came. Courtney didn’t have a driver’s license and had only driven a car a few times before, but he got the idea that he needed to DO SOMETHING! It was this initiative in Courtney that saved so many lives. Courtney and his friends ended up borrowing a few school buses and planned to fit as many people as they could in each and get the people to safety. They packed the bus really full and from the descriptions it was crazy just how tight and cramped that bus must have been. Still, Courtney had even more obstacles to face as he drove the people to shelter and food. The police and National Guard weren’t letting anyone out! Now this is what makes me really upset. They weren’t helping these people and they weren’t letting them leave either to find help themselves. It was terrible. Courtney ended up finding another way out and with luck on his side he ended up making it to Lafayette to the Cajundome where they had set up a shelter for people. What really made Courtney endearing and special is that he was true to his word. He saw people on the side of the road who were trying to get away as well. They were victims of the Ninth Ward, one of the heaviest hit areas of New Orleans. He knew there was no room left on the bus or he would have let them on. Courtney told these people he would come back for them and he did. I’m sure those people thought they were doomed and they were overjoyed when they saw Courtney come back in his big yellow school bus and bring them to safety. Courtney Miles is a true hero and his story touched my heart. I cried in many parts as I read through it. I actually had a hard time putting it down and read the book in two sittings. His a story of courage and shows the there are still people out there with good hearts who do care. Courtney Miles is one of those people and I recommend you read his story. It’s an amazing one. I am going to add this Last Bus Out to my good reads. I love true stories.